Spread over 12000 sq ft and built remarkably opulent, Rabbit Hole is one of the finest additions to Hauz Khas Village. This luxurious lounge officially opened on Friday, 11 August in the presence of gorgeous actress Huma Qureshi Khan, renowned Hollywood director Gurinder Chadha and famous Indian singer-songwriter and music producer Sukhe who celebrated the success of his new song Superstar accompanied with many other celebrities and VIPs. 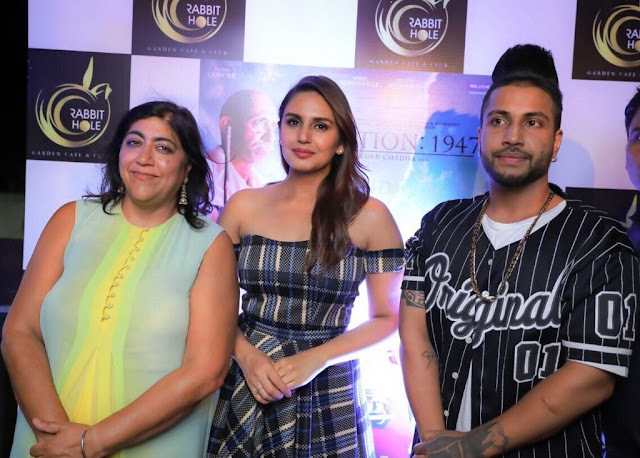 Huma Qureshi also promoted her film upcoming film 'Partition 1947' and expressed her views by saying "I'm glad that Rabbit Hole team invited me today at their grand launch." Commenting on the Premium Lounge opening, The Rabbit hole team, 'Sumit Aggarwal', 'Apoorv Ghai', 'Mansi Singh' and 'Sunil gupta' said: “We are delighted to be here today, seeing our dream project finally come true. We look forward to showcasing the very best of our hospitality”. The Rabbit Hole is a premium lounge overlooking the beautiful lake of HKV into which the sun sets gracefully every evening. It will take you to Alice’s wonderland with beautiful olive terrace, opulent cabanas and a club that’s speckled and wide in varieties. It is a must visit place to treat yourself with delectable fusion food, exotic drinks and sheesha in an opulent sitting both inside and outside.